View from NBC7 news chopper showing haze from smoke layer. The shift in winds seen as an advantage for firefighters to get an upper hand on the multiple wildfires throughout the county is also contributing to a deterioration in air quality. "Now, we are experiencing a reversal to an onshore flow. It will do good for humidity levels, and temperatures will cool, which is good for firefighters, but our air quality is suffering. That smoke is now being blown back at us," said NBC7's Meteorologist Jodi Kodesh. Kodesh added two factors are causing the air quality to deteriorate to a level unhealthy for sensitive individuals, such as those with asthma. One is the reversal in the onshore flow, and the second is a temperature inversion. "It’s basically a layer up in the atmosphere where the air is warmer, and that layer of warm air acts as a ceiling, or cap, trapping the smoke from rising up and dissipating," she said. 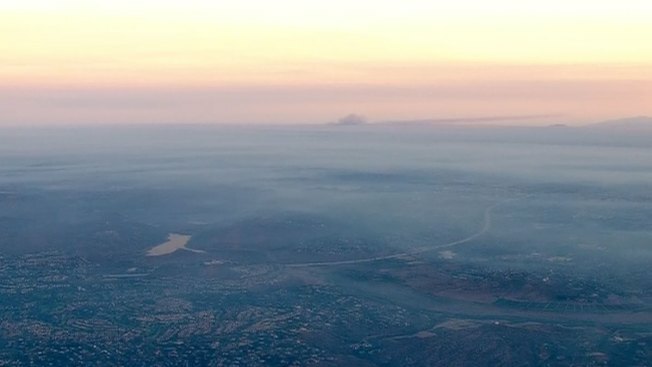 The air quality in San Diego dropped Friday from moderate to unhealthy, according to the Environmental Protection Agency's air quality index. Kodesh said the air quality is no where near as poor as during the 2003 or 2007, when much more acreage was burned.